Did You Miss Me, This Time? I would have to say thank you to Cathy Greenblat. By inviting me to New York and asking me to participate, you forced me to think and feel in a new and different way. 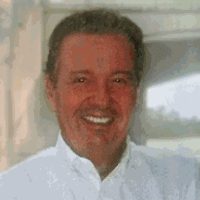 Things have been choppy here on the Alzheimer's Reading Room the last several days as I prepared to go to New York and speak at Pace University. I'll have a lot to say about what I learned about and about my own experience in the coming days. I was pleasantly surprised as a large bunch of readers came to Pace to attend my workshop, and many stayed to hear me speak with a group of very talented people that included Richard Taylor, who I met in person for the first time. Right now I have to thank Cathy Greenblat. Cathy is the author of Love, Loss and Laughter. Subtitled, Seeing Alzheimer's Differently. Seeing Alzheimer's Differently was also the name of the conference. I had the opportunity to see the larger version of the images in Cathy's book. They were mounted in the Michael Schimmel Center for the Arts in the say way you might see paintings in museum. Each of these images portray the deeply forgetful in a way that is rarely seen - with dignity, honor, respect, and an alive look on their faces. There are a long list of messages contain in these images but for me my first thoughts were almost always -- More There. More there than most can imagine. 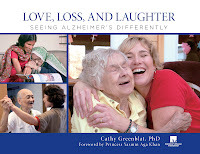 Cathy's book goes a long way to accomplishing two important mission: destroying the myth that Alzheimer's is an automatic death sentence, and destroying the stigma that is often attached to Alzheimer's. I couldn't help but think as I walked around the arts center and viewed each image -- if only people knew. If only people knew how the deeply forgetful are full of Love and Laughter. This was the first time I met Cathy in person. Oh my goodness, what a women. I'll have to write about Cathy soon. I really missed Dotty. I missed her more than I did when I went away for two days in January. Maybe it was because I was far away, instead of right down the road in Miami. Maybe it was because I had to think so much about our life together in preparing to speak. In some odd way, I can't believe it happened the way it did. I would have to say thank you to Cathy Greenblat. By inviting me to New York and asking me to participate, you forced me to think and feel in a new and different way. I intend to leverage this new found understanding in the days, weeks, and months ahead on the ARR. One thing for sure, I now want to meet more of you in person. Can you believe that was the first time I agreed to speak in public? It is a lot different than short segments on television and radio. Okay, now I have to make sure everything is "hunky dory" with Dotty. This time I didn't even give her a chance to be mad at me, like last time. I defused her in about 15 seconds. I'm back and Dotty is going "you who".